Excuse me, Mister, or is it Mistero? I was relaxing in the paneled lounge of my men’s club. Heads of lions and rhinos and other big game kills hung on the walls and cigar smoke-filled the air. I sat in my leather wing-back, surrounded by other men in their smoking jackets, while tuxedoed waiters brought us martinis and scotch and sodas on silver trays. “I think we should start calling married men Mistero, and keep Mister for unmarried men,” I said to fill a lull in the conversation. “But then how will we be able to tell which of us is married, and which isn’t?” I asked. of oil would continue to increase, and who’s favorite football team would lose the most players to concussions this season. This exchange is ludicrous of course, for no other reason than that sort of men’s club only exists in old mystery novels and BBC period dramas. Most of us are lucky to get away for a half hour to share a beer in the neighbor’s garage. It’s also ridiculous to feel the need to distinguish married men from unmarried ones through titles, but that’s exactly what we’ve done to women for centuries. The practice of using Mrs. and Miss has gone by the wayside in most workplaces. People rarely address each other by their last names, and when they do, such as in formal letters, Ms. is commonly used. Not only is it more universal, it prevents someone from having to guess at what salutation is appropriate. Still, there is one place that Mrs. and Miss (and Mr.) is still in regular use, and that’s in the classroom. 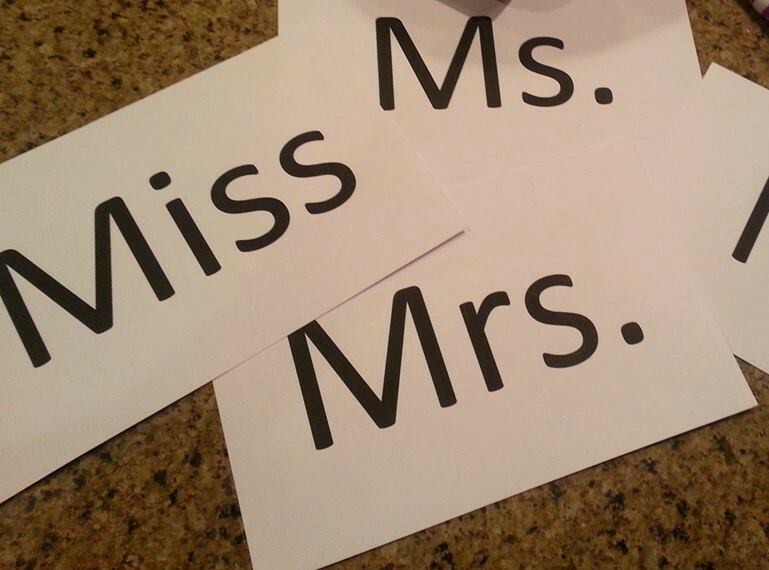 Students are taught to address their female teachers by their last name using the salutation of Mrs. or Miss. This is mind-bogglingly old fashioned, disrespects the teachers and sends the wrong message to children. Mrs. and Miss were not always used to signify whether or not a woman was married (you can read more on this history here – add link). They both derive from the term Mistress. While today, this generally refers to someone who is having an affair with a married man, in the 18th century, it could also refer to a woman who was in charge in some way or who had a specific set of skills. When a man asks a woman to marry him, it is expected that he be able to earn enough to support them both. The woman should then stop working outside the home, so as to create a job opening for a man who needs the job. My mother worked as a registered nurse while raising six children. A lot of people looked down on this. What they did not understand is that my father had a bad heart valve due to rheumatic fever, and wasn’t expected to live past the age of thirty. If he died, she would have no way to support the family. As it turned out, developments in open heart surgery allowed my father to receive an artificial valve and live to the age of 79. Still, my parents were able to pay off their house early, put six children through college and have a comfortable retirement. I also don’t think my mother would have been fulfilled as a stay at home mom. Working as a nurse might have had its frustrations, but it also gave her a certain amount of self-worth and money of her own. While this may be right for some, it wasn’t right for her. It does not matter whether a teacher is married or not, no more than it mattered for my mother all those years ago. It says nothing about the person’s skills as an educator. Yet we still use Mrs. and Miss, and in doing so teach our children that this distinction is somehow important, and needs to be highlighted. Now, before you go saying this is just a bunch of politically correct mumbo-jumbo, let me remind you that the term politically correct was invented by people who didn’t wanted to demean the idea that people should be spoken to and about in a respectful manner, and that terms that somehow degraded races, genders, ethnicities, etc. have no place in civilized society. It isn’t politically correct, it’s just plain correct. Perhaps we need a new way of addressing all teachers. After all, attorneys use Esquire. People who have done nothing more than bury themselves in libraries, developing theses around the poetry of Lord Byron that no one will ever read or care about call themselves doctor. Being an educator takes much more skill, training, experience and dedication than what most people have. If you don’t believe me, spend a day in a classroom and find out. I would personally keep my quiet little office in place of a room full of unruly eight year-olds you have to mold, shape or at least contain for several hours a day. So how about if we stop calling them Misses and Miss like they just walked out of some 1950’s sit-com and provide them with some title befitting of the respect they deserve. I’m not sure what this would be, but Hero springs to mind.